Weight : +/- 1 kg. High speed filter filling machine for packing product in non woven heat sealable filter paper. The machine operates at a speed of 280-300 sachets per minute. The machine is designed with technical perfection and rugged construction so as to meet with your requirements exactly both now and in years to come. Unitek Packaging Systems Pvt. Ltd. This packing machine is shell and slide drawer type. Packs up to 10 cigarettes in one pack of any length in solid bundle type or easy access pull foil type. 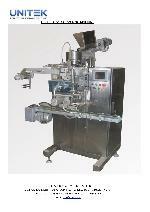 Machine will be in two parts- Filler and Sealer with delivery system. Also, the machine is supplied with full set of guards. We offer Three-In-One Machines. Bidi (biri) tobacoo/gutkha/chewing tobacoo-patti(flake) making & classifying machines from dried raw . Superior and advance than gradecut gradewell (2-in-one) machines.